Which U.S. Cities Have Changed The Most This Decade? “This place has changed” is a refrain you often hear from a city’s longtime residents. But change is a curious, inconstant thing; as some communities undergo great transformations, others seem frozen in time. Change isn’t necessarily a good or bad thing. Big growth in commute times and rents can be negative, but they can also be a function of positive developments like job and income growth. Similarly, places without as much change could be more attractive to people working their way up the salary ladder or those retirees on fixed incomes, offering more affordable housing and less congestion. Over the past decade, most U.S. cities have experienced at least some degree of change, whether the change has been for the better or worse. These changes may be indicative of emerging economic opportunities, or on the other end of the spectrum, economic decline. 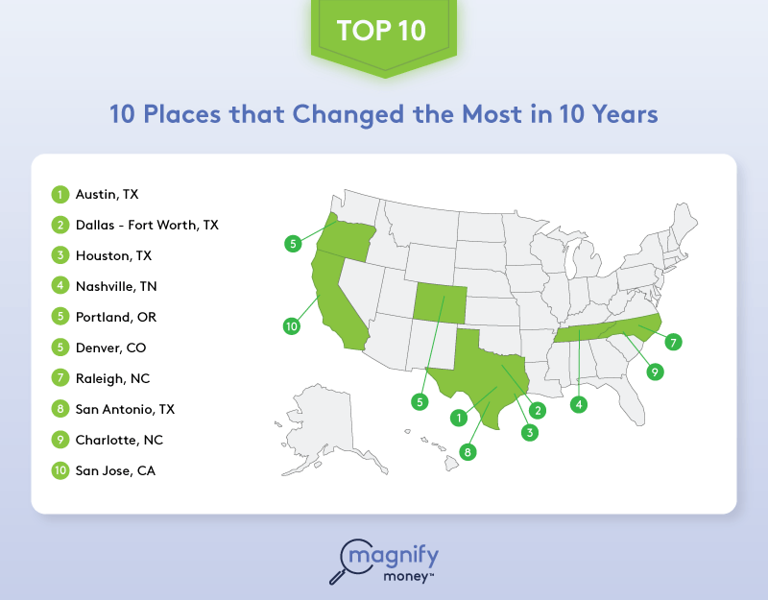 MagnifyMoney, a subsidiary of LendingTree, analyzed the 50 largest U.S. metro areas using nine elements of data to measure and identify areas of growth, decline and inactivity. The analysis examined home prices, crime rates, building permits, commute times and other elements to identify areas of high metropolitan change and give each city a “Change Score” of 0 to 100. According to the data, Austin, Dallas - Fort Worth and Houston round out the trio of big Texas cities that received the highest Change Scores among the largest U.S. metro areas, suggesting that Texas is a hot spot for change. There is some expectation that the tech-heavy Bay Area, specifically the metro areas of San Francisco and San Jose, would rank high on an analysis on change. The San Francisco metro area has seen a 37% increase in income over the last 10 year, while the San Jose metro area is up 36%. However, while housing prices in the Bay area are among the most expensive in the country, these prices have not grown as much over 10 years as other metros like Dallas, Houston, and Austin. San Jose ranked No. 20 for house price growth since 2006, while San Francisco ranked No. 47, using an index that accounts for all communities in the metro, not just desirable suburbs and neighborhoods that have seen outsize appreciation. Furthermore, crime rates have not declined as rapidly in the Bay Area as in other parts of the country. On top of crime statistics, the rapid rise in commute times negatively impact the Bay area. Commute times increased 18% across both the San Francisco and San Jose metros, also ranked No. 1 of 50 metros, on top of already high levels of congestion from the peak of the last business cycle. 1.Austin, Texas (90.4). Austin is a magnet for change, with the fastest job growth in the nation (+40% since 2006), 60% of residents moving since 2010, and a 54% rise in house prices since 2006, the most of the 50 metros ranked. 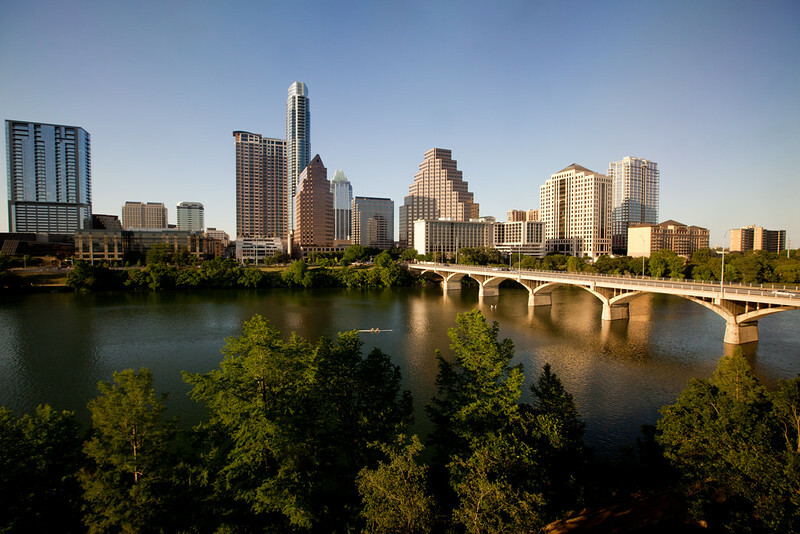 Relatively lower living costs than tech centers like the San Francisco Bay Area and Seattle, along with a combination of satellite offices of larger tech companies, a burgeoning startup scene and no state income tax all contribute to Austin’s change leadership. The lowest-ranked element of Austin growth, building permits (No. 25 of 50), explains some of the outsize housing price appreciation. 2.Dallas-Fort Worth (89.7). Dallas isn’t tops for change in any of the nine categories we looked at, but it ranks high because it’s in the top 10 for five categories, and ranks no lower than No. 19 (growth in rent, at 31% since 2006) for any single category. Dallas-Fort Worth’s top rank is for the decline in its crime rate, No. 4 (and down 43% from 2006). 3.Houston (86.2). Houston rounds out the trio of big Texas cities at the top of the change list, led by housing factors. It ranks No. 2 for house price appreciation, at 38% from 2006, and No. 3 for building permit expansion. It lags on crime rate change (-27% from 2006), on which it ranked No. 23 of 50 metros. 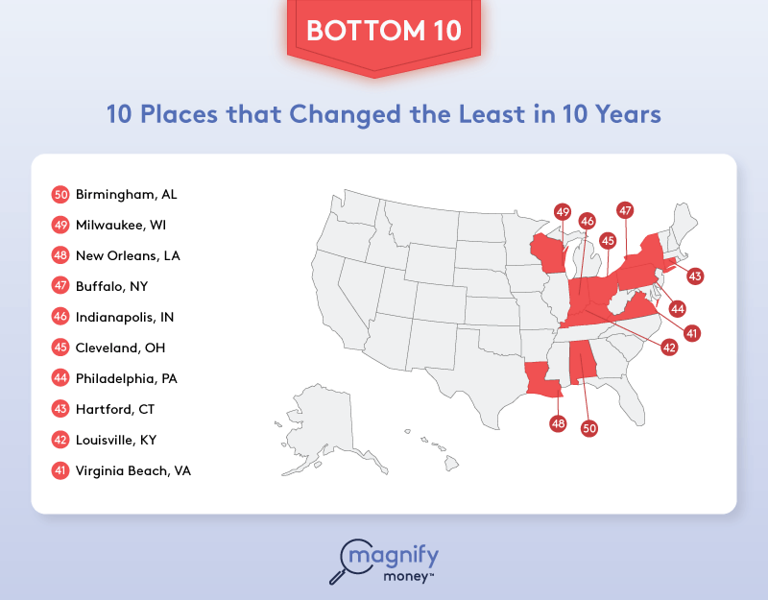 Birmingham, Ala. (61.1) Birmingham ranks in the bottom half of change for all nine metrics we analyzed, and notably lags in employment growth, at 3% in the 10 years between 2006 and 2016. House prices, a double-edged sword, are down 2% from their 2006 level as of 2016, while commute times are identical to levels seen at the start of the 10-year period. Milwaukee (61.7) Milwaukee also lags in employment growth, at 4% in 10 years, but it’s one of the few areas where rent growth hasn’t significantly outpaced income growth, with median rent up 19% in 10 years (while incomes rose 15% over the same period). New Orleans (63.4) While New Orleans is third from the bottom in terms of change, in the wake of Hurricane Katrina in 2005, it has made big progress in one key metric; employment is up 30% since 2006, giving this city a No. 3 ranking among the 50 largest metros for growth. Where it lags is in metrics where too much change is a negative: rent growth and commute-time growth. Median rent in the New Orleans area is up 17% in 10 years, ranking No. 48 out of 50, while commute times are up just 1%, ranking No. 47.